Specialty chemicals company, LANXESS India has once again won the Company of the Year Award under the Rubber Chemicals category in the recently held Tyre & Rubber Industry Leadership Acknowledgement (TRILA) Awards in Chennai on July 12, 2017. LANXESS India had won this recognition in the year 2016, as well. 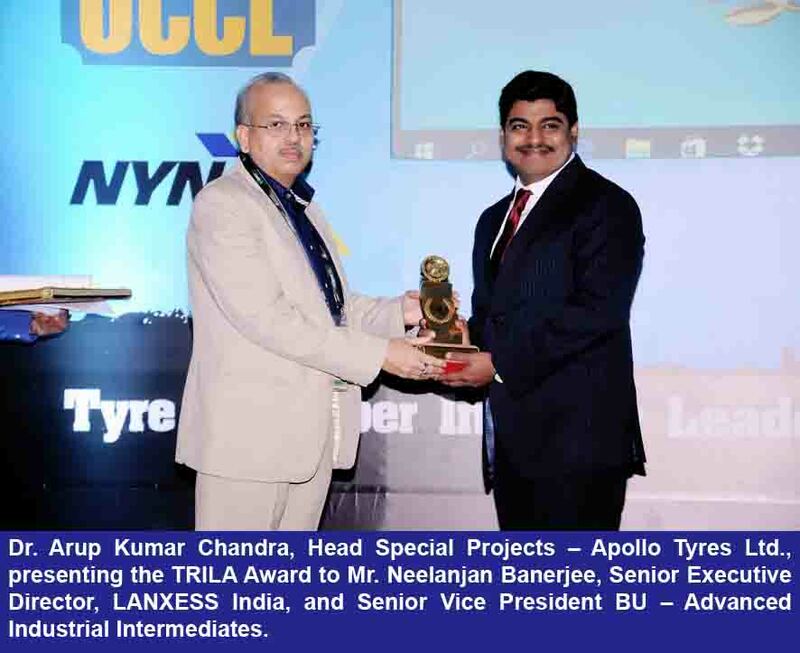 Dr. Arup Kumar Chandra, Head Special Projects – Apollo Tyres Ltd., presented the Award to Mr. Neelanjan Banerjee, Senior Executive Director, LANXESS India, and Senior Vice President BU – Advanced Industrial Intermediates. Presented by Tyre Times, the TRILA Awards endeavour to felicitate the talent in the tyre industry for their achievements and excellence on various fronts. The Awards were lent credence by industry stalwarts who comprised the jury. It included representatives from Tyre Industry Research, UK, Elastomer Technical Development Society, Apollo Tyres Ltd., JK Tyres & Industries Ltd., CEAT Ltd., Nippon Carbide and Vizeum (a unit of Dentsu Aegis). Business unit Advanced Industrial Intermediates, deservedly, won the Award as it showed a significant rise in its production capacity, sales and market share over the year. In the past year, the BU AII also doubled production permits for Antioxidants at Jhagadia site from 7,500 MT/annum to 15,000 MT/annum. The team not only sold out the Jhagadia production but also supplemented sales from our sites in Bushy Park (US), Kallo (Belgium) & Brunsbüttel (Germany). Over the past two years the BU AII was able to penetrate into all major tyre accounts in India and develop a lot of new business which was the principal growth driver for this business in India. “It is great to have been recognized for the second time consecutively, with this Award. I would like to thank the entire team that relentlessly worked towards taking the business to the levels where we are today”, said Mr. Banerjee while thanking all the customers and stakeholders for their support over the past years that has seen the business line AXX achieve higher production & sales in almost all the products. LANXESS is a leading specialty chemicals company with sales of EUR 7.7 billion in 2016 and about 19,200 employees in 25 countries. The company is currently represented at 75 production sites worldwide. The core business of LANXESS is the development, manufacturing and marketing of chemical intermediates, specialty chemicals and plastics. Through ARLANXEO, the joint venture with Saudi Aramco, LANXESS is also a leading supplier of synthetic rubber. LANXESS is listed in the leading sustainability indices Dow Jones Sustainability Index (DJSI World) and FTSE4Good.